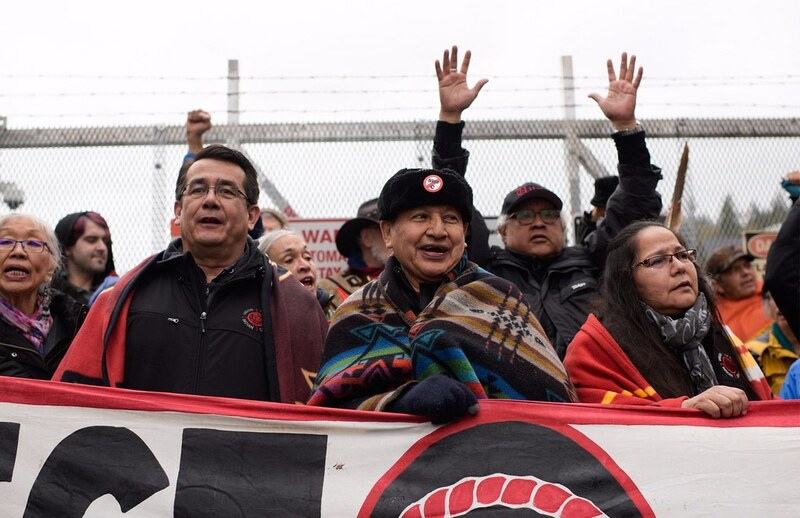 Ta’ah Amy George, Grand Chief Stewart Phillip, Indigenous leaders and hundreds of others including author Naomi Klein shut down work at Burnaby terminal of the Texas oil giant. Today Ta’ah Amy George, (Tsleil-Waututh Nation elder), Grand Chief Stewart Phillip, (President of the Union of B.C. Indian Chiefs, which represents more than half of Nations in B.C. ), Chief Judy Wilson (Neskonlith First Nation in Secwepemc territory), and Chief Bob Chamberlin (Kwikwasut’inuxw Haxwa’mis First Nation) were joined by hundreds of others – including author Naomi Klein — in a full-day blockade at Kinder Morgan’s Burnaby construction site. The action represents the latest escalation in a growing, decades-long fight by Indigenous Peoples to gain recognition for Indigenous title and rights. Nearly 200 people have been arrested peacefully resisting the pipeline in solidarity with impacted Indigenous communities since actions began last month. The Kinder Morgan pipeline — and the tar sands expansion it would enable — are incompatible with the federal government’s commitments under the United Nations Declaration on the Rights of Indigenous Peoples (UNDRIP) and threaten to worsen the national crisis of Missing and Murdered Indigenous Women and Girls (MMIWG).